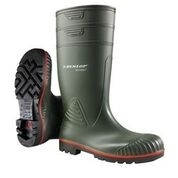 Steel Toecap Wellington Boots. Made from PVC/ nitrile rubber with steel toecaps. These boots are resistant to oil, acids, blood, disinfectant and various chemicals. Sizes 6-12 available.